Good morning, this weekend I had a chance to get caught up on much needed patching, cleaning and hanging projects. I also got caught up on the issue of Elle Decore which I have sadly been neglecting. 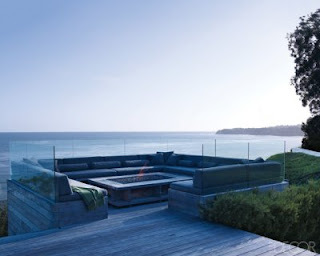 To my delight it was the home of Courtney Cox and it was right up my alley. Take a look. The perfect mix of color and texture bring this calm living room together in a very informal way. I love how her all her living and dining spaces open up to the outside with those expansive windows giving you a true outdoor feeling and so much light. Nothing too fancy in this bedroom yet it gives a feeling of being on retreat. I would love to wake up to coffee looking out those windows. 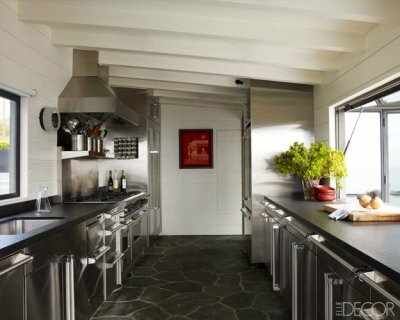 I love the lived in utilitarian feel to her kitchen areas. What a stylish way to get your hands dirty while entertaining in style. 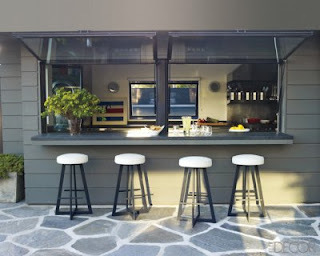 My absolute favorite part of all however are all her outdoor entertaining areas. 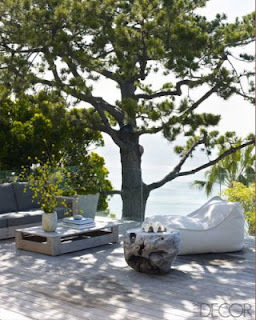 The color scheme which stays consistent from the inside out in the muted grays and natural textures and is just stunning as are those views. It is calm yet inspiring which is in my opinion what a home should be. You don't need punches of color all over to give your home character and precision in design, you simply needs lots of texture and visual interest.